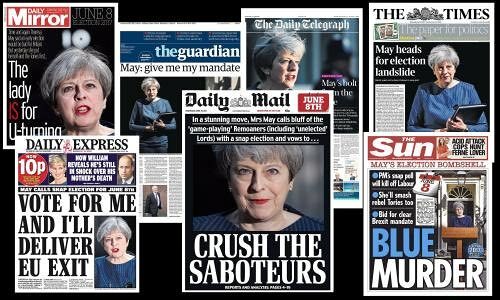 The top solo scorer in last week's newsquiz was Toby Brown with 16 points and the top team was the Penman Partnership with 17. Other notable scorers were Liz Gerard and the Batstone Collective on 15, Gavin Devine 14.5 and Nick Martin 14. Here is this week's quiz. 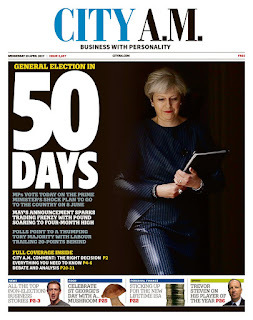 As usual there are 25 questions about the week's events. Let me know how you get on. 1. In a speech to activists in Bridgend, Theresa May used which three-word phrase 12 times? 2. Foreign Secretary Boris Johnson said the electorate should not be fooled by Jeremy Corbyn even though they might regard him as a 'mutton-headed old ______'. What is the missing word? 3. 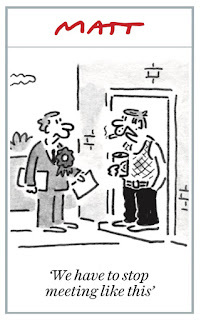 Boris Johnson’s sister Rachel signed up for which political party? 4. An Ipsos Mori poll found what percentage of voters saw Theresa May as the 'most capable' of the leaders of the main political parties? 5. Leading anti-Brexit campaigner Gina Miller has raised almost £300,000 to support pro-EU candidates in marginal seats. 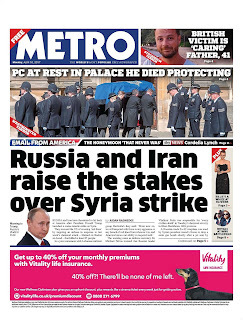 According to press reports the sum includes a £25,000 donation from who? 6. The Liberal Democrats barred former Bradford East MP David Ward from standing again after Tim Farron said his comments about who had been 'deeply offensive’? 7. 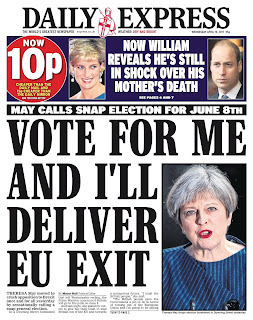 UKIP leader Paul Nuttall told the Express and Star in Wolverhampton that his political views were 'a decade ahead of our time’ and compared himself to who? 8. The age difference between French president favourite Emmanuel Macron and his wife, who was his school teacher, has raised eyebrows. How old are they? Half point for each. 9. 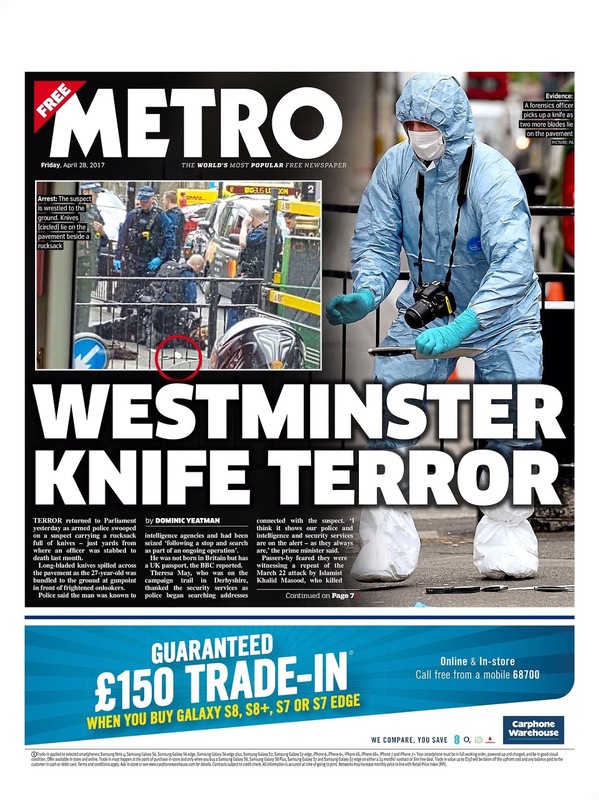 Armed police tailed a man carrying a rucksack containing knives from the moment he got off a tube train at which London underground station? 10. The managing director of Newcastle United was questioned and released without charge after a raid by HMRC officers. What is his name? 11. A historic concert hall in Bristol is ditching the name it shares with a 17th century slave trader. What is the hall's name? 12. Which two teams won their semi-finals and will appear in the FA Cup Final next month? Half point for each. 13. Which bird was internationally celebrated with its own special day on Tuesday? 14. Who chased a man, who had crashed a stolen moped, through gardens and across a building site in London? 15. Nestlé announced it is cutting up to 300 jobs in the UK and switching production of which chocolate bar to Poland? 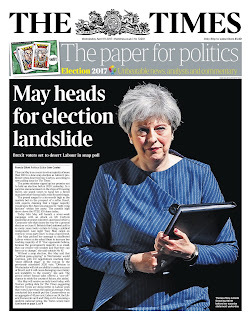 16. Who said: 'May 3rd 2017 – another day. 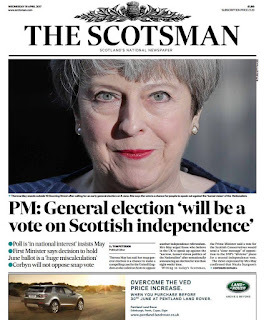 But ten years – a horrible marker of time, stolen time’? 17. What was American Admiral Harry Harris referring to when he told the US Senate Armed Services Committee that ‘it’s the worst I’ve seen’? 18. Laura Kenny was made a CBE alongside her husband Jason and said: ‘It's such a huge honour, but I feel like all I do is ___ ___ ___.’ What are the missing three words? 19. 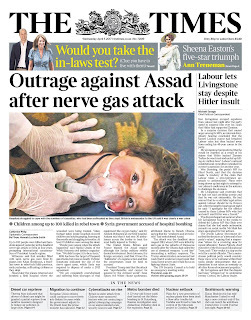 Why was Mike Samwell in the headlines? 20. Serena Williams hit back at 'racist' comments after Romania's women's tennis coach Ilie Nastase used which three words to describe her unborn child? 21. Elton John took ill and cancelled the entire run of his show The Million Dollar Piano which was due to be held in whch city? 22. Celebrities including former England manager Kevin Keegan and comedian Vic Reeves received damages and an apology from which company over phone-hacking? 23. Who arrived in London to take part in photo shoots but was refused entry and escorted back to a plane at Heathrow Airport? 24. What was removed from the shelves of Sainsbury's and Marks & Spencer following complaints of a change in taste? 25. United Airlines denied claims that Simon died on board one of its planes on a flight from London to Chicago. Who was Simon? 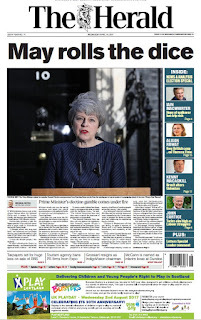 The chaos that David Cameron started continues. 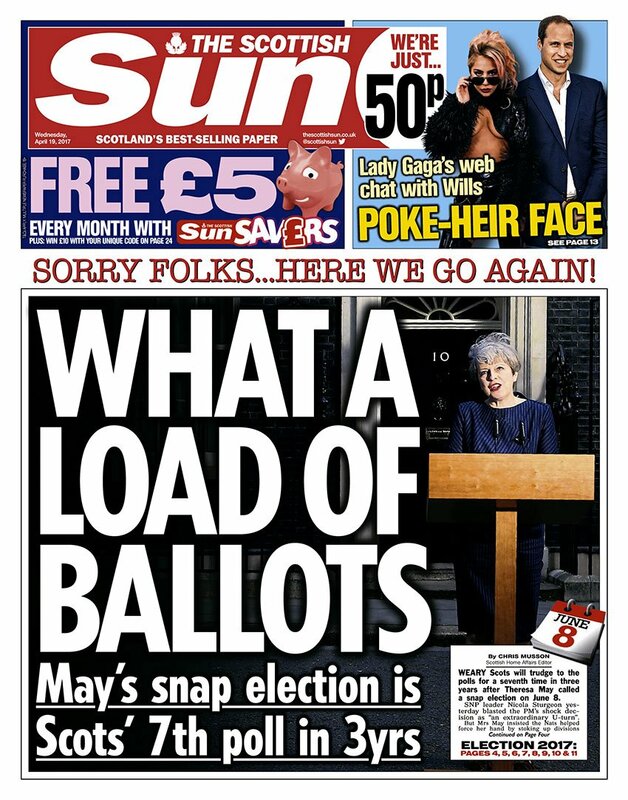 Here are today’s front pages on Theresa May’s announcement that she is pushing for a June election. 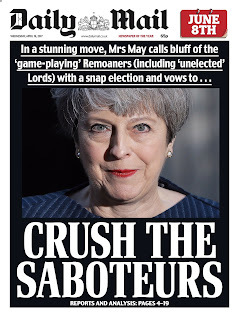 The Daily Mail, of course, is on May's side. 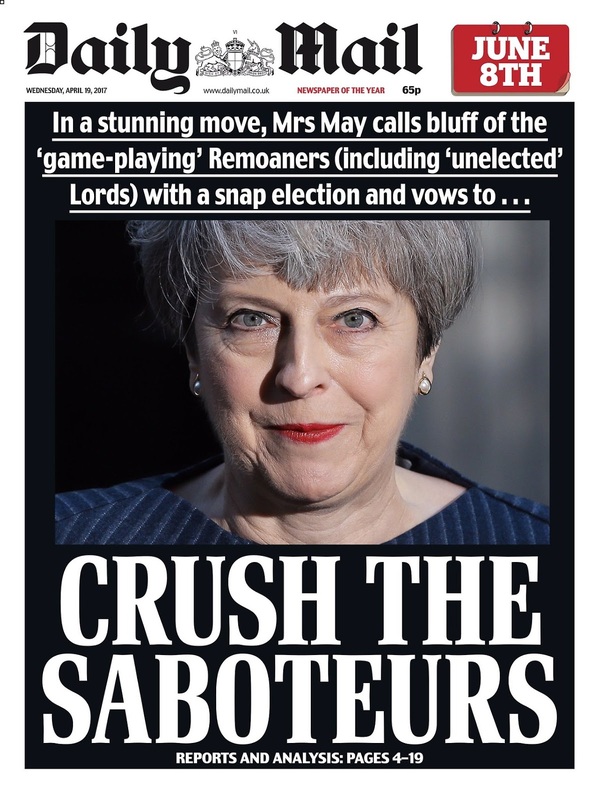 It uses a smiling, if slightly sinister, pic of the PM and reckons she has called the bluff of the 'game-playing' remoaners. 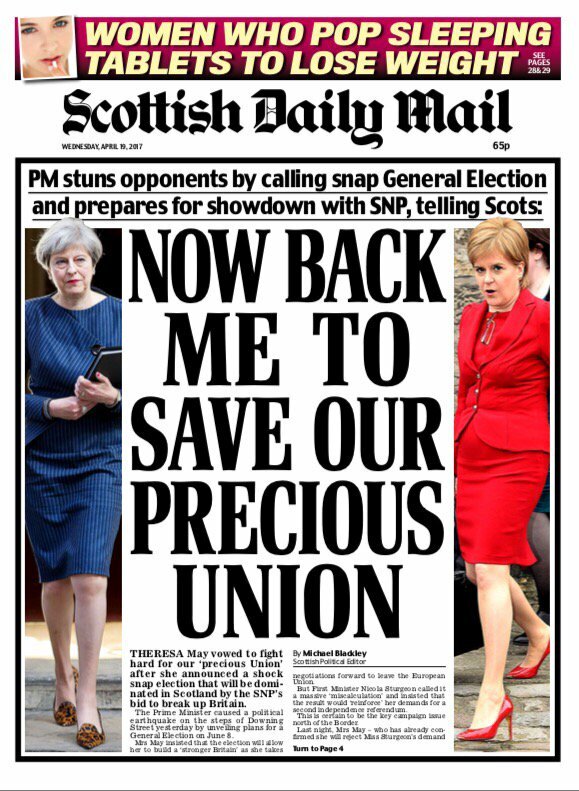 It's an unequivocal message - a rallying call once used by Lenin - which caused a bit of a Twitter stir. 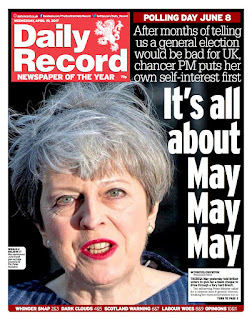 The Scottish Daily Mail isn't quite as bullish ... but the message is still clear. Is it just me or do the colours and design of the page look vaguely like the French flag. At the other end of the scale The National actively tells its readers to vote against Brexit ... and for a Tory-free Scotland. 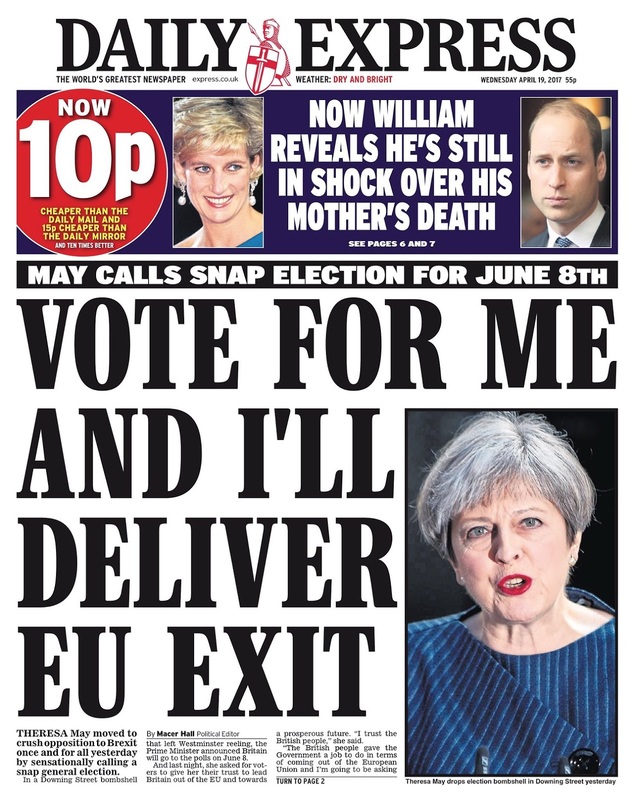 Back to the Brexiteers ... and the Daily Express paraphrases the Prime Minister's message. Meanwhile the Morning Star pulls no punches for the other side. 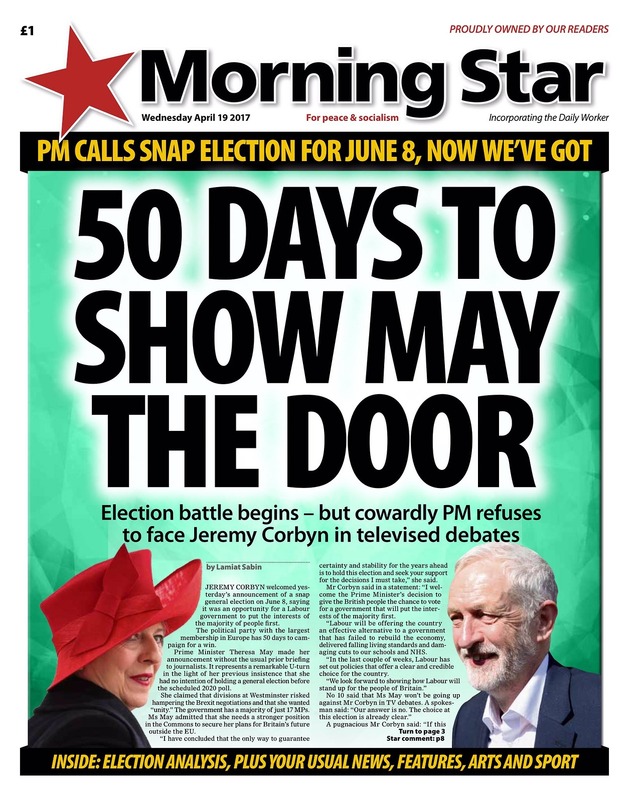 It calls the Prime Minister 'cowardly' and instead of a live picture uses one with her wearing an absurd red 'Paddington' hat. 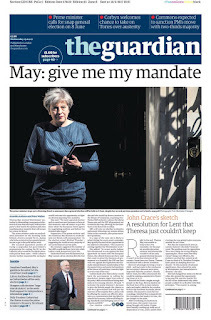 The Guardian also paraphrases the PM's message and uses a John Crace sketch on the front. 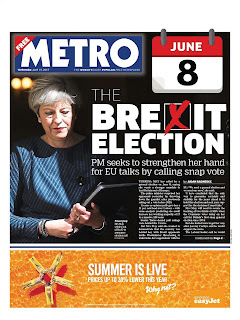 Is the big shadow to Mrs May's left a cryptic message? 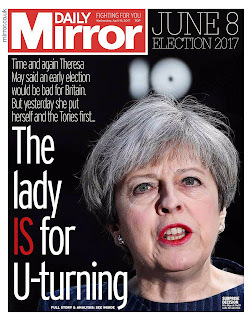 The Daily Mirror terrorises its readers with a haunting memory of Margaret Thatcher. 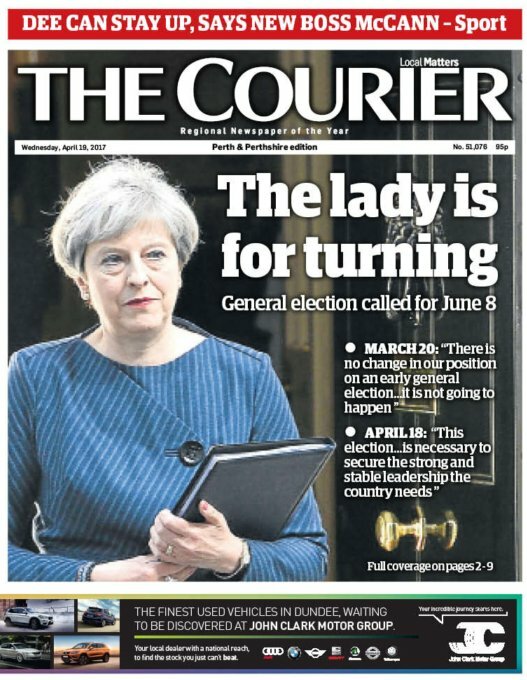 'Yesterday she put herself and the Tories first,' it says. 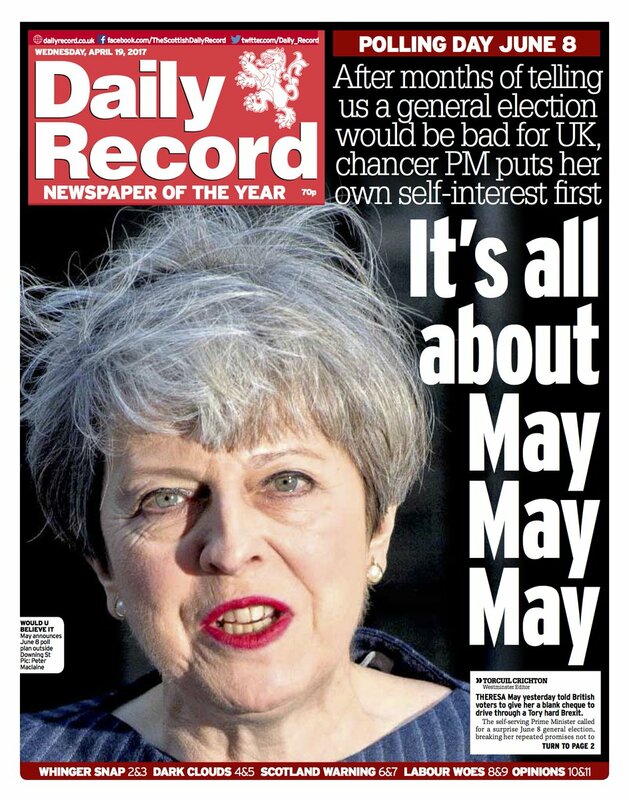 The Mirror's sister paper in Scotland, the Daily Record, goes for a more dishevelled picture and also opts for the line that it is all in the PM's self-interest. 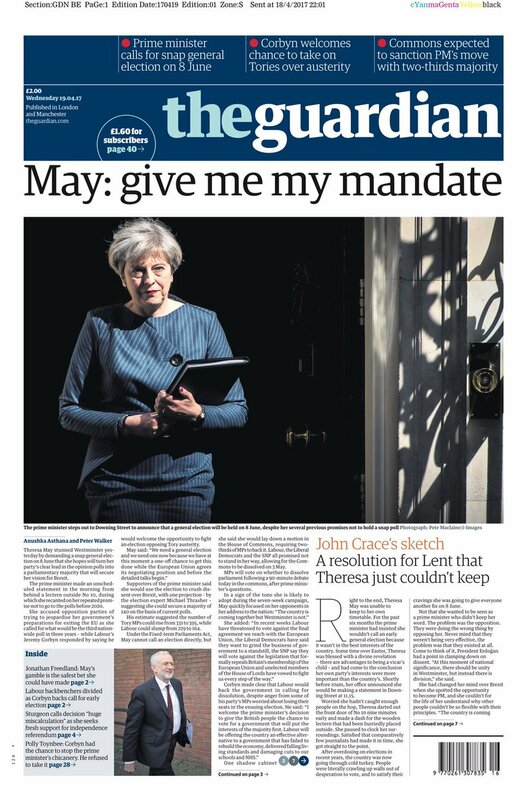 Good headline. 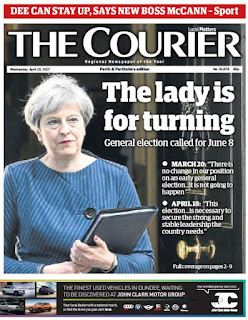 The Courier in Dundee also picks up on the lady is for turning angle. 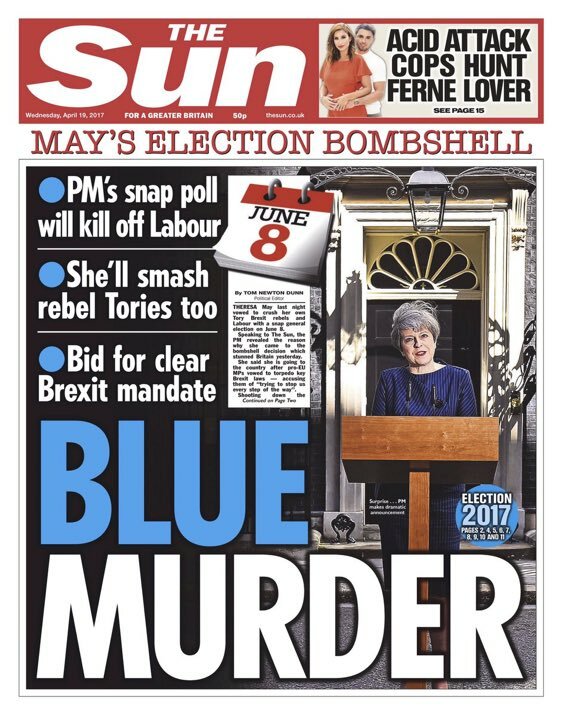 Blue murder says The Sun ... which really means an 'extravagantly loud outcry'. About right I guess. 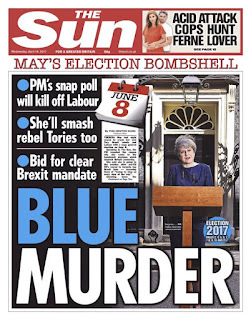 The paper is confident that the PM will kill off Labour and smash the rebel Tories. 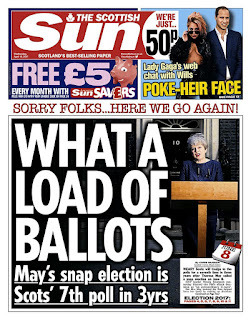 The Scottish Sun has the pick of the tabloid headlines ... reflecting the poll-weariness of the Scots (and maybe the rest of us too). 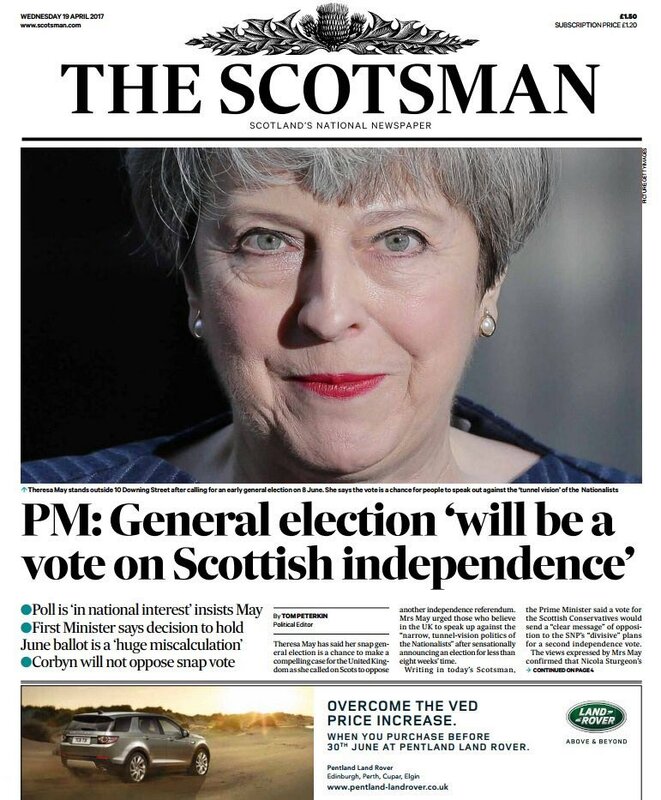 The Scotsman reckons the Scots have got their referendum after all. 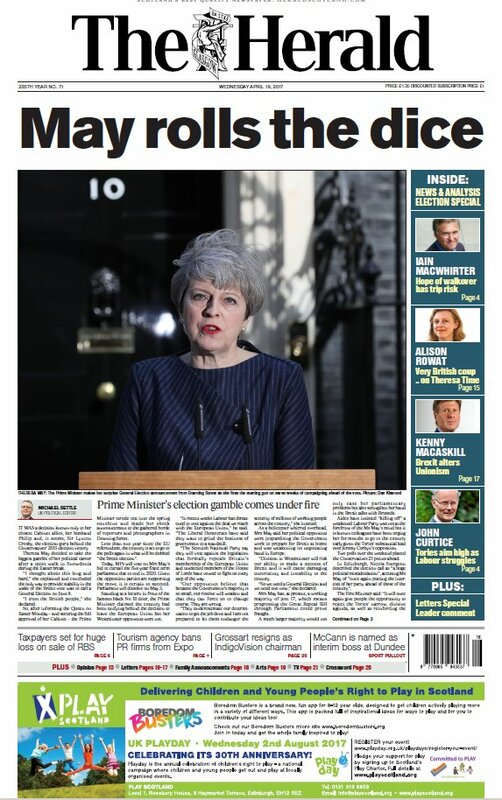 Elsewhere in Scotland, The Herald sees the decision as a gamble ... albeit with the dice heavily weighted. 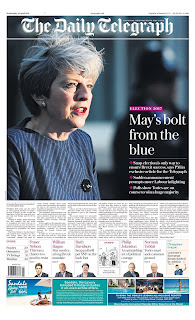 The Daily Telegraph goes for strong display ... overlaying the masthead on the photo and declaring 'May's bolt from the blue'. 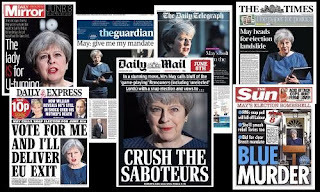 Its columnists are all definitely on the May side ... 'an astonishing act of political courage,' says Philip Johnston. 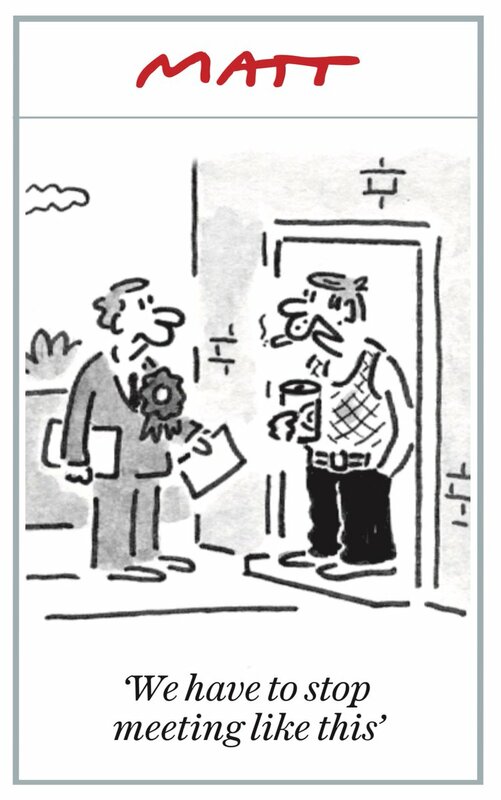 Meanwhile Matt, as always, hits the nail on the head. The Times reckons it will be a landslide. 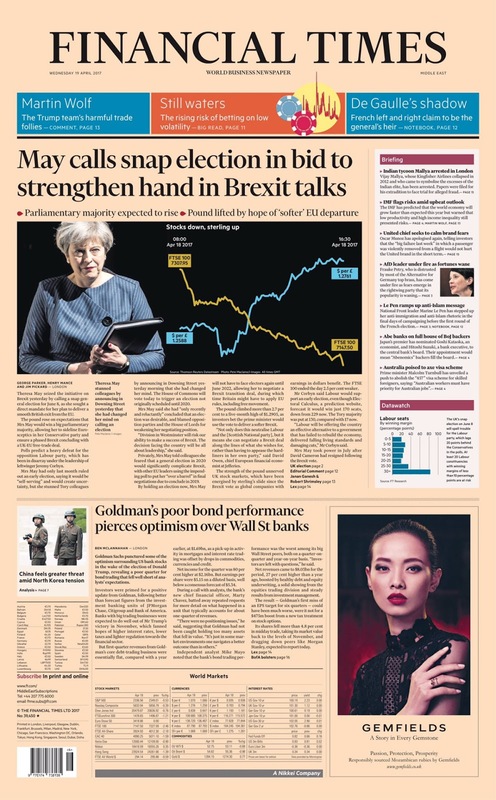 Its polling info is that there will be a Tory majority of more than 100 as Labour's pro-Brexit supporters will desert. 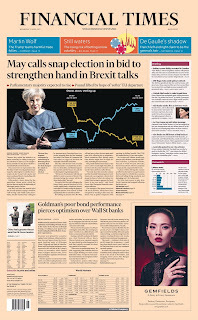 The FT goes with its usual 'matter of fact' headline ... but the graphic is good. The yellow line shows what happened on the FTSE, the blue line what happened to sterling. Little wonder we are confused. Metro has no axe to grind ... so plays it down the middle. 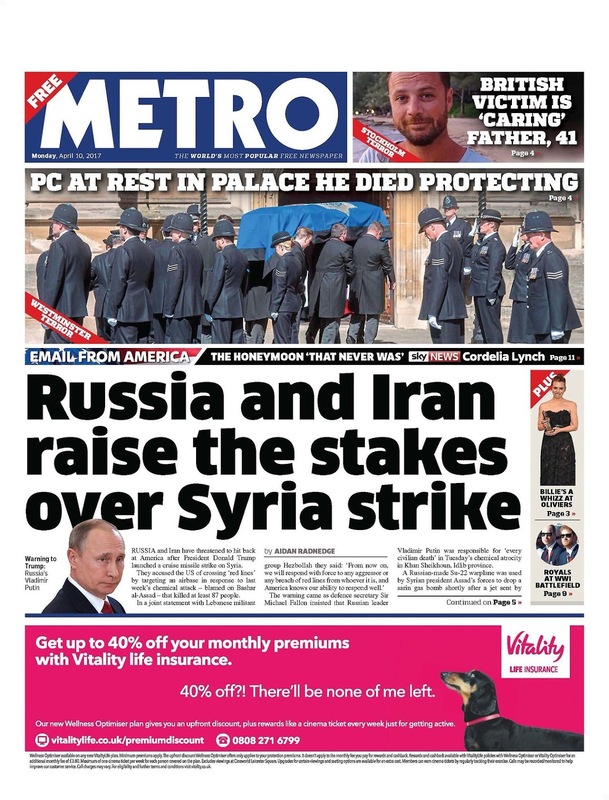 Good page, the X in the headline is a nice touch. 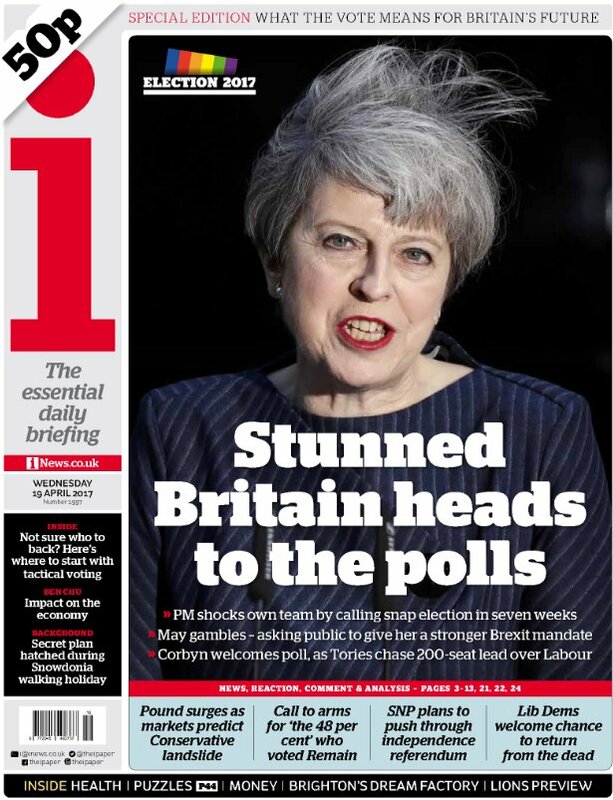 The i uses a windswept picture of Mrs May and plays the headline as straight as can be. 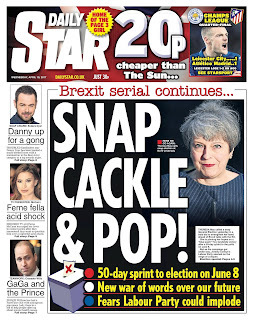 The Daily Star opts for a Rice Krispies' theme. 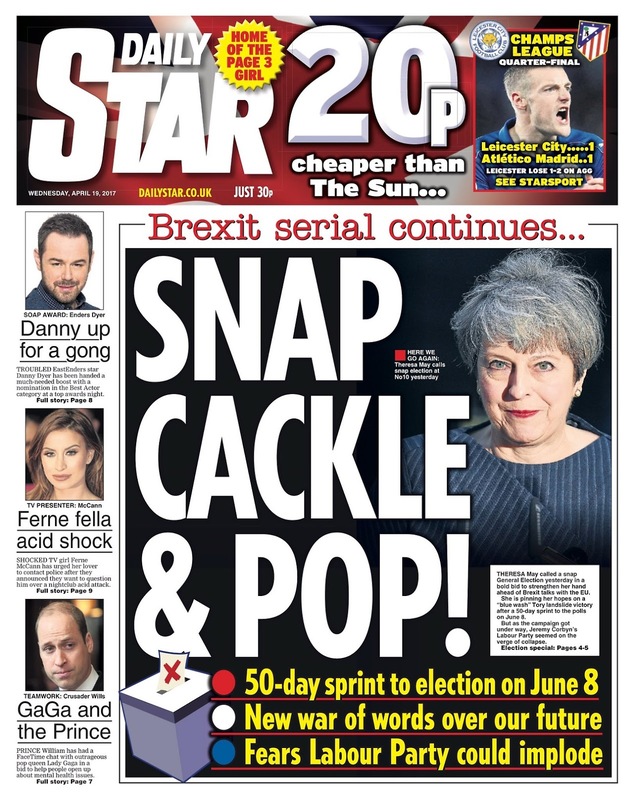 Well, what else can you do with the word 'snap'? 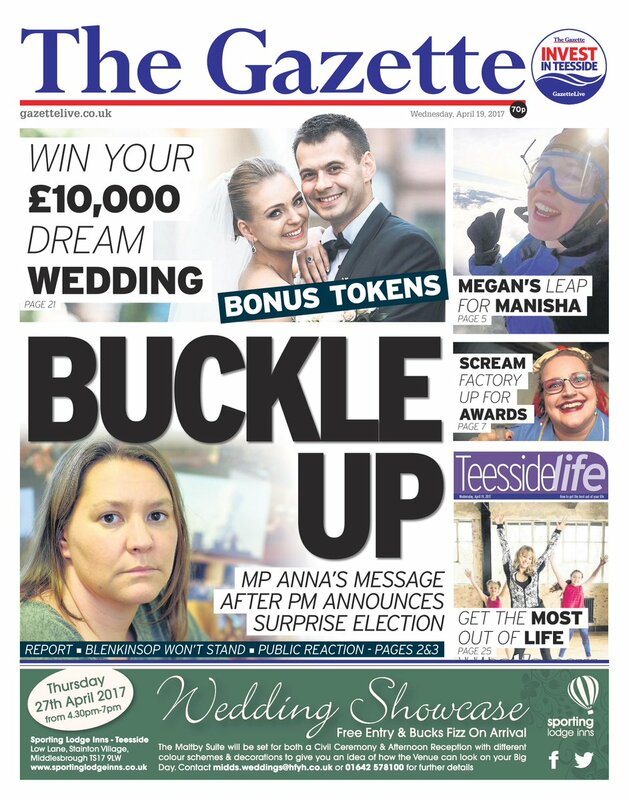 The regional papers needed a local angle and The Gazette in Teesside uses a quote from Redcar MP Anna Turley that it was time to 'buckle up'. The Northern Echo reports on an early casuality ... Tom Blenkinsop, MP for Middlesbrough South and East Cleveland, who announced he will not be standing because of 'irreconcilable differences' with Jeremy Corbyn. 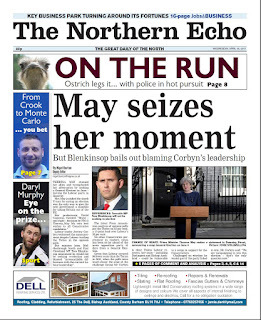 The blurb isn't about that though - it's about an ostrich that legged it in Newton Aycliffe. 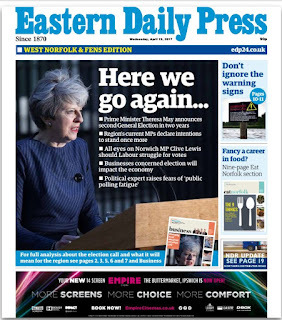 Elsewhere, the EDP is clearly suffering - maybe like the rest of us - from election fatigue. But there will be some good stories emerging throughout the country in the next 50 days. 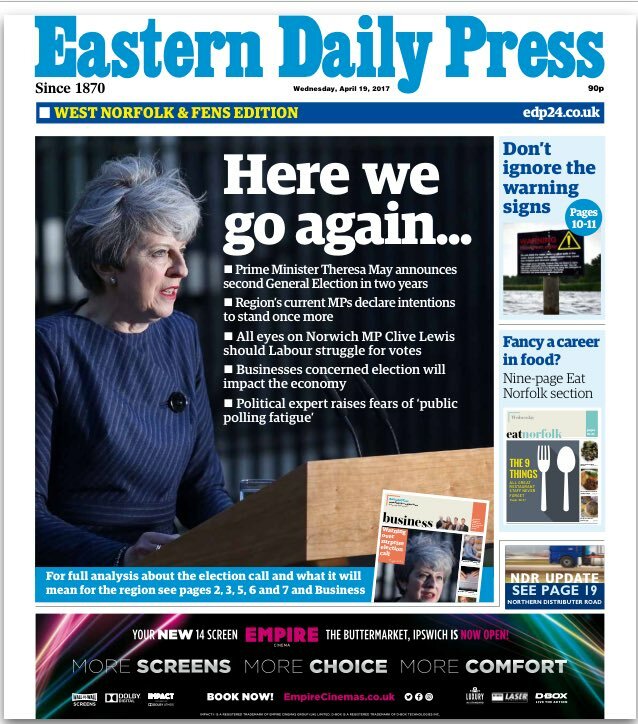 It is a real opportunity for regional papers to shine. 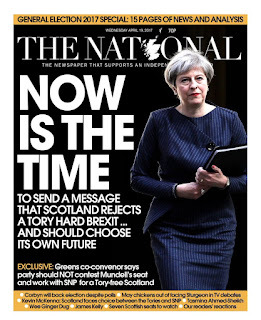 Thanks as always to Tomorrow's Papers Today. There were some healthy scores in last week’s quiz. The top solo players were Damon Wake and Liz Gerard with 19, Janet Boyle and Gavin Devine on 18 and Steven Silk on 17. The top team efforts were by the Batstone Collective with 17 narrowly beating the Penman Partnership on 16. 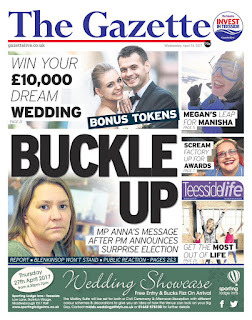 Here is this week's quiz - as usual 25 questions about the week. Let me know how you get on. 1. America dropped its largest non-nuclear weapon on ISIS caves in Afghanistan. The bomb is know as the MOAB, Massive Ordnance Air Burst, but the initials also stand for what nickname? 2. 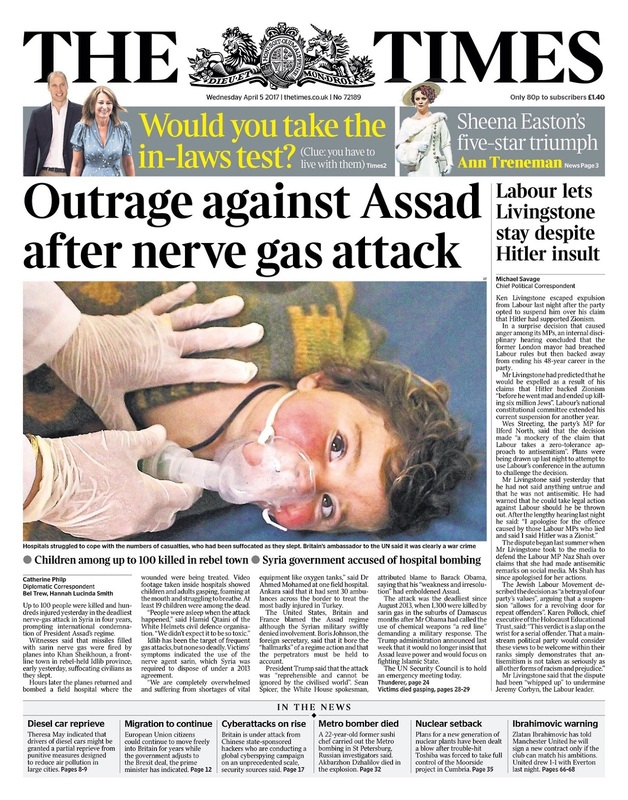 White House press secretary Sean Spicer was criticised for saying: 'We had someone as despicable as Hitler who didn't even sink to using _____ _____.’ What are the two missing words? 3. Foreign Secretary Boris Johnson failed to gain support for sanctions against Russia at the G7 summit in which city? 4. Who, according to a tweet by US president Donald Trump, is ‘looking for trouble’? 5. Borussia Dortmund’s team bus was attacked on its way to a Champion League quarter final game against which team? 6. What was the name of the 41-year-old father of two who was among the victims of the Stockholm terror attack? 7. Red and white floral tributes on murdered PC Keith Palmer’s hearse spelled out ‘husband' ‘son' ‘brother' ‘uncle' ‘Keith’ and which other message? 8. Dr David Dao was forcibly removed from an 'overbooked' United Airlines flight at which airport? 9. Which theatre production picked up a record nine awards at the Olivier awards? 10. Why has Edward Enninful been in the headlines? 11. What was the name of the horse which won the Grand National? 12. Cedric Anderson shot dead his estranged wife and an eight-year-old boy at a school in which American city? 13. Whose computer did Chris Hutcheson admit hacking? 14. For which American supermarket chain has Victoria Beckham designed a range of clothing? 15. Golfer Sergio García won the US Masters after a sudden-death victory over who? 16. What is the name of the film, depicting a real life crime and starring Larry Lamb, Joely Richardson and Phil Daniels, that is released today? 17. Which company reported a £1.28 billion annual profit and recorded its first full year of growth since 2009/2010? 18. Ed Sheeran settled a $20million (£13.8m) copyright infringement claim after copying ‘note for note’ a song, which was a hit for X Factor’s Matt Cardle. Name the two songs. Half a point for each. 19. At the High Court Mr Justice Francis ruled that 'with the heaviest of hearts' he would allow doctors to let a boy die with dignity’? Name him. 20. Teenager Manus Deery, shot dead by a British soldier 45 years ago, was 'totally innocent' and did not pose a threat to anyone, a coroner recorded this week. 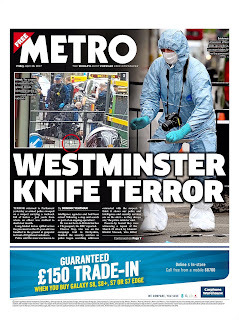 In which city was the boy shot? 21. Which company, that dressed Audrey Hepburn and Marilyn Monroe in its heyday, collapsed into administration, putting almost 700 jobs at risk? 22. What did Saffiyah Khan do that led to her picture going viral? 23. Hundreds of refugees and migrants went missing after a large fire ripped through a camp in which town? 24. Why was Querelle sacked? 25. What was the name of the elephant that the Queen and Duke of Edinburgh fed at Whipsnade Zoo?